By the end of the day, there were over 30 responses. While some shared their initial reaction to the term, others added their feelings on the topic. The topic of biblical womanhood can often be an intense debate, combining our identity as women and the Bible we hold dear it’s no wonder the discussion is continuous. 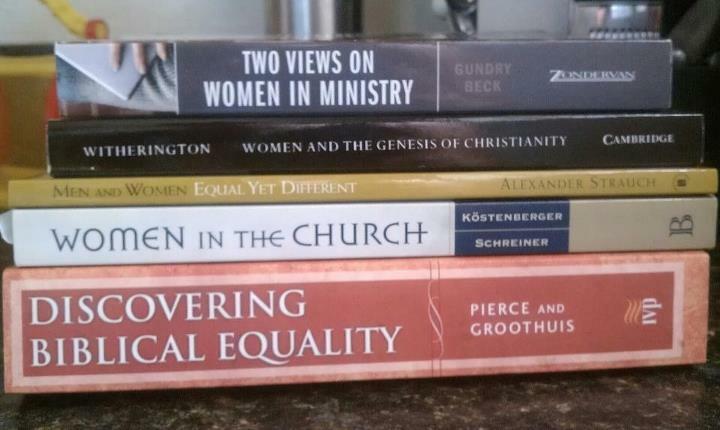 For awhile, I’ve wanted to dive deeper in the topic of womanhood, gender roles, and the role of women in the church to study the varying opinions and history of womanhood, specifically how it relates to and affects church. For the most part, I know where I stand. I’ve done my own studying and believe what I do because I am convinced it is true. I can’t read the Bible and confidentially see it another way. Should a woman hold a position of leadership in the church over men (children’s director, worship leader, etc)?, Are the terms ‘director’ and ‘leader’ thinly veiled to fall into the complentarian view though truly pastoral positions? Should a woman teach a co-ed Sunday School class (even if under the authority of her pastor and/or husband) ?, Should a woman be a deacon?, How does the office of deacon differ from elder? Even in conservative, complentarian churches the answers will vary. The more I think of the biblical womanhood I’ve read of, seen, and practiced the more convinced I am it is very much Americanized. Search ‘women’s ministry’ or ‘women’s ministry ideas’ and you’ll be met with not ways to actually minister to women, but how to decorate, set-up, and execute a women’s ministry event full with flowery details and Jesus-lite. Women are more than events and so should our ministry. Aside from that, women’s ministry and role in the church, even the discussion itself, is often limited to wives and mothers. But what of the other women? If biblical womanhood is to be truly biblical it must encompass all women. Biblical womanhood must embrace every stage of womanhood. Much of the discussion on womanhood is centered on being a wife and mother, and while most women do become wives and mothers it is surely not the calling for all. Even the term ‘stage’ or ‘season’ assumes a woman will one day be a wife or mother, but what if she won’t? How do we effectively minister to a woman who is single, a widow,or barren when so much of our time is spent on what she is not? Do we even realize how much weight and significance we put on the role of wives and mothers? They are most definitely significant, but does that mean a woman who never becomes a wife or have child has a lesser role? By no means! Yet, that is, more often than not, the message they receive. What of the 16-year-old believer or the young professional? Do we simply train them to be wives and mothers, even if that season is decades away? I think we do a disservice to all women when we assume the role of wife and mother. We place a higher value on being a wife or mother than on being a disciple of Christ—which we are for eternity and not just a season. Biblical womanhood must be cross-cultural to be truly biblical. I truly believe this, but if I took the Americanized version of biblical womanhood to Ethiopia, India, or South America is probably wouldn’t translate well. We have our nuances, though not painted as law are often suggested as such, that tell us to have our homes hospitality ready with cups of tea and tidiness, to read our Bibles in the morning to be the best woman, to not work outside the home (it’s ideal though not always possible, they say), and to dress in a decidedly American, feminine way. Most of our biblical womanhood nuances rest on having money and possessions. What of the woman who has been kicked out of her home for believing in Jesus? What of the destitute who lives in a shanty and doesn’t have food for tomorrow’s meal? What if she isn’t a bargain shopper? What if she can’t stay at home? I believe that if a woman’s only source is the Bible, whether she’s in Ethiopia, Iran, Tokyo, or my own city she should be able to read it and know what it is to be a godly woman without hundreds of commentaries, stacks of books on the topic, or even a Bible with cross-references. The Bible should answer the question itself. So even though I am reading the stacks of books and commentaries, ultimately I’d like to see how it all measures against pure Scripture. I believe story is a powerful tool for change and it has been through story my attitude and perspective of others in this issue of womanhood and the church has changed. To put it nicely, in the past I have been very ungracious to my egalitarian sisters. While most of my opinions stayed in my head, I often approached this debate with little regard for them, believing them to not really know the Bible, love Jesus, or that they just wanted the authority of position. There’s no other way to call this attitude, but sin. It was very wrong of me and I am sorry for it. One of the things blogging has done for me is to bring me closer to women and ideas I wouldn’t have contact with otherwise. My heart has been softened and I have grown in compassion to other women through hearing their stories. Even if I don’t agree with them, I am better able to see their perspective and to understand how they got to where they are. I’ve found that many women have not had my experience in church. I am thankful I have been in churches that encouraged and equipped me to serve, listened to my ideas and opinions, and truly respected me. I felt empowered and strengthened in church. Sadly, many women have not. Through hearing the stories of others, many women have been denied the opportunity to serve even in the most benign situations, told they were less than because they are women—humiliated, embarrassed, ridiculed. These were not meant for women and especially not in the church. I have no desire, in my study or discussion on the various topics surrounding womanhood, to get into heated debates, begin slinging stones, or participate in “us v. them.” I’m interested in hearing what people think, believe, how they got there, and why. I don’t care to defend the cause of complentarism or my view of biblical womanhood. I don’t feel compelled to. I know some will disagree with me and say the glory of God is at stake if I don’t, but is it really? Does God glory really hinge on how many “converts” I bring to this side of the issue or how strongly I press it? Will God somehow become less God if I don’t take up arms? I care for the truth, but I also care for people. I care for unity in the body of Christ. And while I may disagree with people, on both sides of the fence at times, I desire to see and participate in discussions that are mutually beneficial and edifying. I believe these discussions can be loving, compelling, stir compassion and understanding, and not be divisive. It’ll just take some humility. In the end, if it doesn’t build up the body, doesn’t make us more like Christ, doesn’t cause us to love each other and Jesus more, then what’s the point? THIS: We place a higher value on being a wife or mother than on being a disciple of Christ—which we are for eternity and not just a season. I am tired of the notion that we can only be fully the women God has called us to be if we are wives and mothers. My heart and mind have balked at this idea for many years, since I was about 17 (which would be *ahem* 23 years ago) and began attending a very conservative college. While I grew up in a conservative Southern Baptist Church, my dad – who was and is a pastor – has raised me to believe that my identity in Christ had nothing to do with my gender but instead with choosing the disciple’s life. What a shock to meet girls (because truly, that’s what we were in our late teens and early 20s) who believed their opinions, their giftedness, their worth was found entirely in marriage. To be honest, it created a large “crisis of faith” for me … and it has been a journey for me to reclaim the truths I was taught by my dad and found firmly rooted in Scripture. Thank you, Jess, for sharing your story … and for inviting us to listen to the stories of others and to look first to Scripture for our understanding of womanhood. I know I said this already, but I can see that confidence you have in who you are in you. You’re more concerned about following God and his plan for you than cultural ideals or popular opinion. Thanks for your post! A positive, helpful note! I appreciate your insight! Why so much emphasis on being a wife and mother? Because so many of us are quite good at pursuing everything but being a wife and mother. The issue in America-and yes, our “Biblical Womanhood” is “Americanized” because that is our culture, even though this is a cross-cultural issue-is a culture in which motherhood and being a wife is looked down upon as a lesser accomplishment than “being your own person regardless of gender”, “having a college degree and pursuing a career”, and every other sort of accomplishment so long as it is not *just* being a wife and mother. The focus comes as we try to battle the lies of the world that are incredibly prevalent in our secular and evangelical societies. Being a wife and mother is being trampled on in America and many, many women who are wives and mothers need encouragement and many women not yet wives and mothers need to know that becoming a wife and mother aren’t lesser accomplishments than a career choice. We don’t have a problem with expressing our individuality, pursing a career, being our own person or finding our identity apart from our gender in America. Our problem is with motherood and just being a wife. We desperately need Godly examples of the beauty of Titus 2:4. No one needs to tell us in America that a successful career is to be honored. We are continually bombarded with the lies that we must be more than a wife and mother and homemaker. That’s a lot of pressure and in my opinion, a lot more pressure than my women’s ministry leader standing up and encouraging me to make my home hospitable and ready for service to others or showing me how to love my husband and children. Titus 2 gives us a clear picture of what “women’s ministry” should look like for young women, older women and widows. Titus 2 clearly assumes being a wife and mother on younger women, but in America, society would stone us for speaking this because being a wife and mother is so “archaic” and such a degrading thing especially when not accompanied by a successful home business, a previously attained master’s degree and career success or by working outside the home. Scripture gives clear instruction on what women should be teaching and be taught as women. We are well acquainted with what we are to be taught as believers in general and are taught these things regularly and are taught these things in the midst of “women’s ministry” and programs all the time. God knows that we as women would push back against being wives and mothers (both in america and the world becoming a cross-cultural issue) and He therefore gave specific instruction that women should teach and be taught how to love their husbands and children. Scripture also mentions the gift of singleness. Some will be single, but very few. Specific instruction is given for those who are called to this. Those who are single currently but who will be one day married and have children also desperately need to see examples of and be taught that being a wife and mother is a high calling and be shown by women who are currently what it looks like to love their husband’s and children so that they will be prepared when that time comes. Scripture does not tell us to encourage one another to pursue careers or higher education or successful home businesses because God knew that we would be very good at pursuing and honoring those things on our own. He shows us what is hard to do and where we need to be encouraged and instructed. This is a cross-cultural issue. I can say that because it is Scriptural and Scripture is cross-cultural. As Americans we are especially eaten up with it in our society. When asking “what should biblical womanhood or women’s ministry look like?” I think we need to start with scripture, THEN look at our current congregational needs THEN our cultural needs. I would also like to add on here really quickly that, as women and believer’s in general, we are instructed specifically to be hospitable and service oriented. That looks one way in America and differently in all other areas of the world. So, again I would start with scripture then ask myself the question of what a particular person needs and then what is culturally appreciated and acceptable. For example, in the south where I am from if I am called to serve -and I am- I will be keeping my home clean and ready for service and will probably have sweet tea prepared and candles lit. That isn’t going to look the same for someone from New York or Cali, but that is what is most gracious and serving to my southern neighbor. This doesn’t come naturally to everyone and needs to be taught firstly out of scripture and then with consideration of our current local so we are serving other’s with utmost respect. Mrs. Mohler teaches classes on hospitality that are best suited for women who are in a particular cultural subset, but if that is not where you are, then seek someone out who can teach you what it should look like in your community. *One last thought. I appreciate and respect the desire to remain respectful of other’s opinions and not to participate in devisive or destructive “debates”. However, we are called in scripture to speak truth in love. It does not say not to speak truth or to openly except all thoughts and opinions without pushing back with truth in love. Women need to hear the truth about what the Scripture says about who they are as believers, as women and as mothers and wives and I would encourage anyone to speak the truth boldly, but in love. Opening up a floor for discussion with no instruction has the potential to do more harm than good in the name of tolerance, open-mindedness or any other “good-intention”. I hear you. Our culture definitely places a higher regard on a woman who has an education and career, and if she is a mother or stays at home there’s a push to do something more to make her staying at home okay. For sure. The longer I am a wife and mother the more I feel confident in my position and less swayed by the opinions of the world, so I don’t give much thought to the world’s pressure. I do agree with you that women, both in these roles and not, need to hear that they are good and honorable. But what I am asking (and seeking for answers) is how to minister to women who are not yet or no longer in those stages. I know from my experience in ministry (participating and/or leading) as well as other discussions these women feel out of place and not enough (or that they will be enough when they get there) when the topics revolve mostly around being a wife and mom. I think sometimes in our excitement and passion we can forget about the rest. I know I have. The more I think about my family’s future and what we feel to be God calling my husband to the pastorate, I can’t ignore that demographic. I need to know how to minister effectively to them—what are their needs, concerns, how they fit in the church, etc. I don’t want to be part of a church, helping to lead that church, where women feel overlooked. Scripture doesn’t encourage us to pursue careers or higher education or whatnot, but God may call a woman to one of those and I think as leaders we need to not limit how God calls someone. You’re right, when asking this question or any we should start with Scripture and I have. You have a good point to start with the Word and moving on to congregational and then cultural needs. As to your example with hospitality, it will look different all over the world, but at its core it should be very much the same. Oftentimes in books or lectures on hospitality (or other topics) they’re address and heavily emphasize the outward look of hospitality rather than what hospitality really looks like, which is more than serving tea whether in the South or India. I’m big on speaking the truth in love. I’ve not always been good at it and truly use to be quite harsh with my motto being “truth hurts” and to speak the truth no matter what. Knowing that’s my background and tendency, I’d rather back up a bit than run back into my fallen nature (which would be so easy for me to do). That said, I won’t deny the truth and what I believe, but I believe it can be done without being pushy, defensive, or turn into “us v. them.” In books I’ve read and even being at the seminary, whenever the differing opinions come into contact there’s often an underlining ridicule as if to say “this person’s premise is laughable” and I don’t think that’s honoring or edifying to anyone, it definitely doesn’t help to unify the larger body of Christ. I feel comfortable disagreeing with a person and not understanding how they use Scripture to get to their position, but I don’t feel acting like I have the spiritual upper hand. I wasn’t going to comment on this post because I don’t think I know enough about this topic. What little I do know makes me feel alienated so I just avoid it, but Jess, you’ve made me feel safe to bring my questions and my story with your comment about how you used to view your egalitarian sisters, of which I am one. I’ve subscribed to this viewpoint unknowingly until recently, because to put it simply, I don’t see a place for me in Biblical womanhood as I understand it. I am a wife, and someday I hope to be a mother, both of which I consider my most important roles after Christ-follower. But I consider that just a part of a larger attitude of people/relationships are more important than my accomplishments. That being said, since I was a little girl I have always wanted to do something outside of the home. My favorite question was “What do you want to be when you grow up?” The answers flitted from whale trainer (Sea World) to librarian, teacher, rock star and finally writer/journalist where I have now started my career as an assistant editor. As of now I have no intention of ending that career when I become a mother. Do I have a place in Biblical womanhood? Because I don’t think I do, and that has always upset me because I believe that this desire in me to work outside of the home is a part of my character, personality and heart. You may disagree. You may call it a symptom of my culture or upbringing, but I do not believe that for a second. The main reason I can’t agree with that is because my mother, who has been praised as exemplifying the Biblical principles of being a godly woman (self-control, pure, gentle/quiet spirit) has built for herself a career as a teacher throughout my childhood. So I have a hard time seeing a place for women like me and my mom in Biblical womanhood, which seems so fixated on Titus 2’s call for women to be wives and mothers working inside the home. I am sincerely asking is this perception wrong? Have I been misled? Thank you for sharing. Really. Part of the reason I want to study this deeper and have these conversations is because of women like you who feel they don’t fit in. Even women on the complementarian spectrum feel they don’t fit in. And what does biblical womanhood mean anyway? To answer do you have a place in biblical womanhood, I think you must because a) you’re a woman and b) you love Jesus. I don’t think your desire to work outside of the home is a symptom of culture. If God’s put that desire in your heart, gifted you, and has provided means for you to follow that, then it seems that may be what God has for you. Titus 2 is one to wrestle with and people interpret it differently. In the Greek, “workers at home” is transliterated as ‘oikouros’ meaning caring for the house, working at home (the watch or keeper of the house, keeping at home and taking care of household affairs, a domestic). I think the not neglecting your family is key and things may happen in certain seasons. I think it’s something for you and John to wrestle over together and see where the Lord leads and what it means for your family. I’m not sure there’s a one-size fits all mold. Hey hey, you’re reading a book written by the man I work for! (Alexander Strauch) This makes me smile…for no good reason, other than it’s funny to see it on your blog. I think we probably agree pretty closely on this issue, but I’m looking forward to hearing what you learn through this process!